Rudraksha (also spelled as Rudraksh) is the seed of medicinal plant botanically known as Elaeocarpus Ganitrus. It has great religious significance and used in Indian Folk Remedies & ayurvedic medicines for a wide range of diseases. Rudraksha is helpful in the management for high blood pressure, diabetes, restlessness due to fever, chicken pox, small pox, tuberculosis, chronic cough, asthma, sciatica, heart diseases, memory loss, cancer etc. Botanically, Rudraksha is Elaeocarpus Ganitrus. The seeds are known as Rudraksha, which have several types depending on their structure. Rudraksha tree is a large evergreen tree, which can grow up to 50 to 200 feet. Seeds When Fruits fully ripened, blue color outer shell (husk) covers the Rudraksha beads. Rudraksha Seeds are sweet in taste. Rudraksha colors can vary with brownish shades. Rudraksha seeds and its powder are used in ayurvedic medicine. There are different types of seeds based on structure are available. Ancient texts believe that each has its unique properties and provides specific benefits. Rudraksha has following healing properties. Rudraksha is helpful in following health conditions. According to ancient texts, Rudraksha has several types based on its structure. Each has unique benefits and specific uses. Rudraksha provides strength to the body and helps as adjuvants in various diseases to reduce debility due to them. It reduces headache and beneficial in mental disorders. Rudraksha acts as blood purifier, which reduces blood impurities and increases blood circulation. By this effect, it helps reaching the nutrients to every cell and tissue in the body. Immunostimulatory property of Rudraksha provides protection against common infections. It helps as adjuvant therapy in breathing disorders and chronic cough. The antihypertensive and cardio-protective properties of Rudraksha maintain blood pressure at normal level and prevent heart diseases. Rudraksha powder paste with rose water increase skin glow and brings charming effect on the face. When taken with milk, Rudraksha increases memory and brainpower. It helps in liver disorders and abdominal diseases. 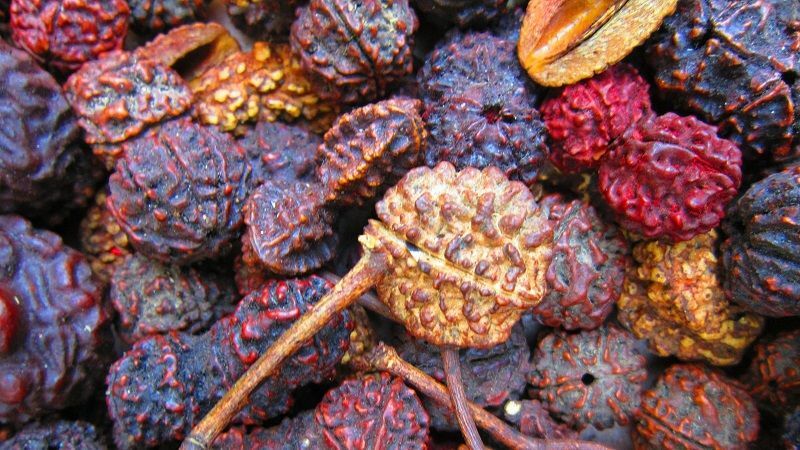 Rudraksha fruit or bark is a good remedy for controlling epilepsy. Here is a brief description of benefits for each type of Rudraksha. It is used in epilepsy. It helps prevent epileptic attacks. Diabetes: 3 Mukhi Rudraksha is beneficial for diabetes. High blood pressure: It reduces elevated blood pressure and provides strength to heart muscles. Fertility: It increases fertility and reproductive power. It increases communication skills of a person and helpful in social phobia. It increases immunity and protects from several diseases. It is beneficial for pregnant women. It protects the developing fetus from various diseases. It also helps preventing diseases after birth of the child. It helps prevent cardiovascular and neurological diseases. It provides peace to the mind along with conscience and wisdom. It is believed that it provides happiness and makes person wealthy to live a very conformable life. It provides happiness and makes person to live a joyful life. It increases self-confidence and provides inner strength. Rudraksha exerts the benefits either by bearing it touching the skin or by oral intake. Generally, for therapeutic benefits, it is taken internally in powder form or applied over the skin in skin diseases. However, preventive action of Rudraksha requires more scientific research studies, but Indian people believe that bearing Rudraksha touching with skin using cotton thread (without using any metal chain) provides protection against infectious diseases and has several health benefits. Internal intake in form of Rudraksha powder (125 mg) with warm water may have immunity enhancer effects, so it is used in prevention of recurrent upper respiratory tract infections in children. Soaking Rudraksha (7 Mukhi Rudraksha) in water and leaving it for overnight, then drink the water on empty stomach in early morning helps preventing heart diseases. Taking Rudraksha Churna (1 to 3 grams) with Shadanga Paniya or warm water helps reduce restlessness, body aches and burning sensation due to high fever. However, this remedy is not commonly used, but it can be used to relieve excessive restlessness and irritability due to fever. Taking 1 gram Rudraksha Churna with 10 ml Juice of Neem Leaves helps controlling blood sugar level. The following Rudraksha Combination is also helpful in diabetes management. This mixture should be taken on empty stomach and twice a day. Ayurveda has suggested following ways to use Rudraksha to manage high blood pressure. Take 250 ml water in a copper vessel and soak Rudraksha in this water overnight. Drink the water on empty stomach. Alternatively, eating 2 grams Rudraksha powder with water kept in copper vessel is more beneficial as compared to first one. The decoction made with 400 ml water and 5 grams Rudraksha powder and then reduced to 100 ml water is also beneficial in hypertension. Rudraksha helps reducing severity of chickenpox symptoms. It reduces malaise, tiredness and headache. Further, it decreases burning sensation and pain on chicken pox rashes. It speeds up recovery process and prevents complications. Rudraksha anti-inflammatory and antimicrobial properties help curing acne and pimples. Its local application is more helpful, reduces recurrence, and provides soothing feeling by alleviating acne symptoms. The following combinations using Rudraksha are used in ayurveda. Mix Rudraksha powder and Arjuna bark powder in equal proportion. Take a teaspoon of this mixture and mix it with 2 to 3 teaspoons honey. Make a thin paste. You can add more honey in this mixture. Apply this Rudraksha paste on the affected parts or on whole face. Wait for 30 minutes and then rinse your face with warm water. This remedy provides glowing effect to the face and skin. It also reduces acne and prevents recurrence. Rudraksha powder can be mixed with lemon juice to make paste and applied on the face. This remedy is more beneficial for improving skin glow. It makes you feel fresh. Rudraksha fades dark spots and reduces blemishes. It is used internally as well as externally. Internal Use: Internally, Rudraksha is taken with Mulethi (Licorice), Amalaki (Indian Gooseberry) and Manjistha. The mixture of these four herbs is beneficial internally to reduce hyperpigmentation, black spots and blemish. A teaspoon (5 grams) powder should be taken with water an hour after meal twice a day. External Use: Fine powder of Rudraksha mixing with rose water is applied over the skin with dark spots, hyperpigmentation and blemishes. The regular use fades the dark spots and makes skin clearer. If patient feels burning sensation in whole body, then the decoction of Rudraksha powder and sandalwood (Chandan) is used in amount of 50 to 100 ml. It gives relief in burning sensation. If patient has burning sensation on the skin, the Rudraksha paste made with rose water is applied over the skin. Rudraksha is rarely used for treating cough, but its powder can be used with honey to cure cough. It is more beneficial when patients have cough with chest tightness and cough starts with irritation in the throat. Rudraksha is beneficial in severe cases of asthma and breathing troubles. Rudraksha and Turmeric powder are mixed in equal amount with honey as above proportion. In acute attach, the patient is asked to lick the paste after every 15 to 30 minutes. In chronic cases, this mixture should be taken 2 to 3 times a day. However, now we have better treatment for tuberculosis, but our ancient doctors were using the following Rudraksha combination. This Rudraksha mixture was given to patients with tuberculosis. Now, it can be used as supportive therapy along with Swarna Bhasma and Vasant Malti Ras in case of Multi Drug Resistant Tuberculosis. Vanshlochan should be added in higher possible dosage to protect and strengthen the lungs. The general dosage of Rudraksha is as follows. Rudraksha is LIKELY SAFE & WELL TOLERABLE in most people within the dosage of Rudraksha as described above. There are no side effects observed with Rudraksha.